KAUAI, Hawaii — It’s a while since I’ve been caught up in a world-wide news event, especially one where I MIGHT HAVE DIED. But there we were, after a five a.m. wake-up call by Kauai’s ubiquitous red roosters, on the first day of our holiday, groggily sipping our coffee in the Saturday morning sunshine. All of a sudden, the island quiet was pierced by an urgent loud buzz on our cellphone. It sounded like an Amber Alert on steroids. “What the heck was that?” I said out loud to other breakfasters gathered on the patio of our inn. No one looked up from their buttered toast. Thinking it was just some sort of glitch, we didn’t investigate further. Then, my companion reported back from the office. The woman behind the front desk had said something about a missile threat, as she busied herself with the office routine. The patio remained an oasis of calm. I glanced at the sky, saw nothing and continued with my coffee. Nobody, it seemed, including ourselves, was going to be bothered about a little thing like nuclear annihilation. After all, we were on holiday. When I subsequently checked the Globe and Mail website, I discovered that the alert had actually been pretty scary, the nonchalance by our front desk clerk notwithstanding. ‘SEEK IMMEDIATE SHELTER. THIS IS NOT A DRILL.” Yikes. And the Hawaiian missile alarm was at the top of the Globe’s story list. We’d been part of history, bad coffee and all. A little later, when we traipsed in to nearby, sleepy Lihue, I asked some of the locals how they’d dealt with the alert. Unlike reports of panic elsewhere, people seemed to have taken it in their laid-back stride. Our cab driver said she’d been stuck in an unrelated traffic jam. She did what anyone would do facing an incoming ballistic missile. She phoned her supervisor. Her boss told her not to worry. The boss’s husband was in the military, and he’d confirmed it was a false alarm. The volunteer at the local museum said he’d slept through the whole thing. “If it was real, that’s the best way to go.” I agreed. As we talked, he noted that some of those who hadn’t taken it seriously questioned why anyone would launch a ballistic missile towards Kauai. He pointed out, quite rightly, that the US Navy’s Pacific Missile Range Facility is on the island, right by the wonderfully-named Barking Sands. The PMRF’s latest mission is to track incoming missiles and shoot them down. “So we could have been a target,” he said, cheerfully. And that was that. There were reports of understandable panic elsewhere, but overall, on beautiful Kauai, the response to possible nuclear annihilation seemed to be: keep calm and carry on. It’s probably not real, and if it is real, what can you do? Meanwhile, for us veterans of the Cold War and the Cuban Missile Crisis, this brought back a lot of unwanted memories, from a time when “Duck and Cover” exercises were very real. During crunch day of the Cuban Missile Crisis, we went to school, not knowing if we would be coming back home. It was truly an eerie and frightening feeling. But of course, we still did exactly what many Islanders did on Saturday. We went about our normal routine. If the bomb was coming, so be it. So for now, ballistic missile dodged. Slap on the sunscreen. 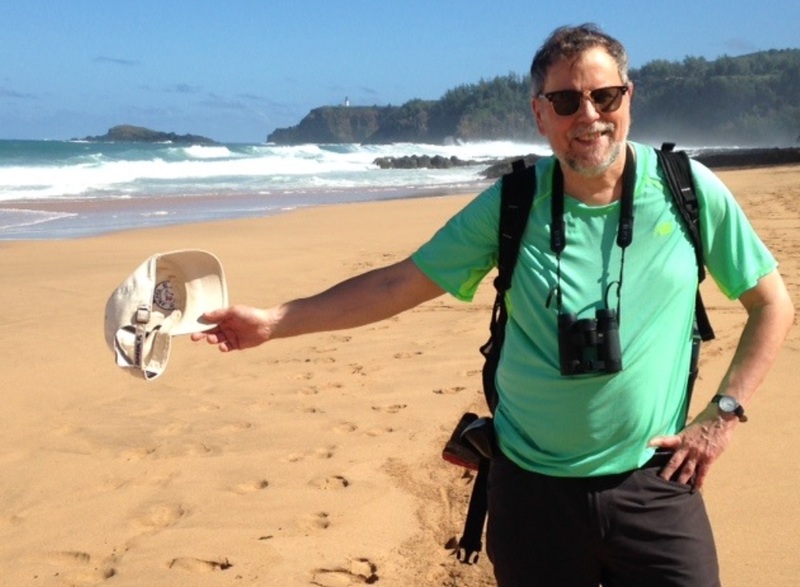 Hats off: Just another day in paradise, dodging UV, and, maybe, gamma radiation. For more Mickleburgh, please visit the archive or Mickleblog.com. 1 Reply to "Aloha A-bomb! A Postcard from the Edge of Armageddon"
This is just a test is right. Let’s see how freaky out Americans will be if we give them a false flag. But let’s not too it on the mainland too risky of it spreading from major city to major city. War of the Worlds? Nope I have an idea, let’s do it somewhere isolated. hhhhhmmmmm. I got it HAWAII. If anyone believes this was an accident I have oceanfront property in Saskatoon. Do you not think it rather strange they never outed the guy that actually did it?